In the early rounds of Linares Aronian had promising positions but failed to collect any full points. That didn’t stop him providing good quotes for Vasiliev at Chesspro. 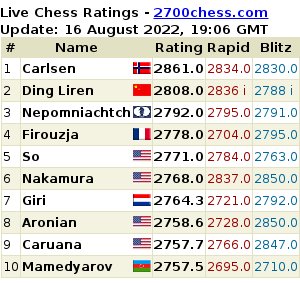 It seems to me that Levon Aronian hasn’t quite found his game yet. “The Berlin – playing for a draw?” I asked. And added that when we were discussing the play of some contemporary grandmasters David Bronstein told me that he used the “Berlin variation” when he didn’t feel very well, as he knew that “white can’t score a goal against the black king without the white-squared bishop”. He compared the black king, rushing around the “goalmouth” between c8 and f8, to a goalkeeper. Levon smiled as he heard me out and said that he plays the Berlin so that “his opponents will have a headache”. – For the moment I still haven’t grasped that I’m playing in a serious tournament and haven’t come to knock out some moves in blitz… – he told me after his first round game with Grischuk. They spent around an hour analysing the game, which had finished early after mass exchanges. – Lost? – from time to time Alexander asked his opponent. And Levon only laughed cheerfully. In almost all lines after the correct 10. Rb1 (instead of the monstrous 10. Qxc3) black got a position that was close to absolutely hopeless. – Well, so why did you play 10. Qxc3? – I asked the FIDE Grand Prix winner and candidate for the world championship. – It’s impossible to explain. Vasiliev’s latest report is up at Chesspro. – The Benoni, you say?! Well, if that’s the Benoni I’ll never play it in my life!